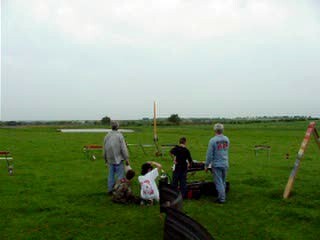 The Dallas Area Rocket Society had been starved for a launch for some time. It was a bit windy, but we finally had an opportunity to some sport to mid-power rockets. I flew my Aerotech Warthog on a single use F engine. The wind caught it and there was quite a trek to recover it. My PML Phobos came along for the ride, but I had forgotten the reload! A rocket designed to look like a pencil was the largest rocket I saw that day.